Tarpaulins are also needed for use as temporary roofing in the sites as well as generator sets to provide power to the centers. 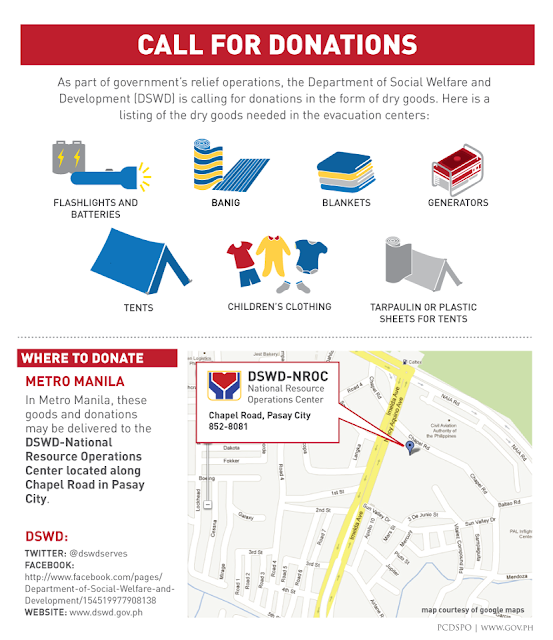 In Metro Manila, these goods and donations may be delivered to the DSWD-National Resource Operations Center located along Chapel Road in Pasay City with telephone number (02) 8528081. Please visit the Crisis Response Page for Typhoon Pablo (http://www.gov.ph/crisis/typhoon-pablo/), the Official Gazette Facebook page at (https://www.facebook.com/govph), and follow @govph, @ndrrmc_opcen, and @dswdserves.